The Thyroid Diet Revolution explains how over 50 million Americans have weight problems related to poor thyroid function. Author, Mary J. Shomon was diagnosed with thyroid disease in 1995. Since then has set out to help other people struggling with similar health challenges. Guidelines to help you determine if you have an undiagnosed thyroid condition. Advice about herbal and nutritional approaches. Recommendations on the best diet plans for thyroid patients. Mary J. Shomon explains that undiagnosed thyroid problems can slow your metabolism and disrupt hormonal balance. This makes it difficult to lose weight even when you restrict your calories. Diagnosis and appropriate treatment may be all that is required to restore your metabolism so you can start losing weight. The Thyroid Diet Revolution discusses the various treatments and medications available for these conditions. Advice is offered on how to boost your thyroid function naturally with herbs, nutrition and other lifestyle changes. The book doesn’t include a specific diet to follow. Rather it explains the pros and cons of a variety of popular diets to help you decide what will work best for you. Eliminate processed and simple carbohydrates. Avoid foods high in sugar. Avoid desserts, especially after larger meals. Some foods contain substances called goitrogens, which can cause the thyroid gland to enlarge. Goitrogenic foods can also slow down the thyroid, resulting in underactivity. The following goitrogenic foods should be avoided if you suspect hypothyroidism. Low-fat cheese, plain yogurt, eggs, anchovies, sardines, lean beef, bison, pork loin, turkey breast, garbanzo beans, lima beans, lentils, peas, carrot, eggplant, pumpkin, mushrooms, potato, peppers, rhubarb, spinach, sweet potato, avocado, apples, berries, kiwi, pears, prunes, bran cereal, whole grain bread, oatmeal, almonds, Brazil nuts, walnuts, flaxseed oil, coconut oil, herbs and spices, green tea. This book does not include a meal plan but instead suggests you consider trying other diet programs. Possible options include Weight Watchers, South Beach or The Fat Flush Diet. The book includes information on T-Tapp exercises, which are specifically designed to enhance thyroid function. This is a workout system performed without weights, jumping or high impact aerobics. It takes less than one hour and should be done at least three times a week. 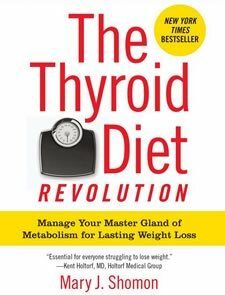 The Thyroid Diet Revolution: Manage Your Master Gland of Metabolism for Lasting Weight Loss retails at $16.99. Click here to purchase The Thyroid Diet Revolution at a discounted price. Provides information about medical and natural treatments for thyroid problems. May offer a weight loss solution for dieters with undiagnosed thyroid disorders. Readers can relate to the personal stories of other thyroid patients. Provides links to a large number of resources. Addresses the importance of stress management for weight loss. Does not include a unique menu for thyroid problems. Necessary to refer to other diet books for meal plans and recipes. Requires a visit to a doctor to test for a thyroid disorder. Author is not a qualified health professional. If you’ve been unsuccessful losing weight with traditional diet plans, the Thyroid Diet Revolution provides information about the management of thyroid conditions so as to support weight loss. It does not include a specific diet but can be used in conjunction with a number of popular diet programs.